This article is about the purple mangosteen. Mangosteen may also refer to the entire genus Garcinia. Mangosteen belongs to the same genus as the other, less widely known, such as the button mangosteen (G. prainiana) or the charichuelo (G. madruno). Mangosteen is a native plant to Southeast Asia. Highly valued for its juicy, delicate texture and slightly sweet and sour flavour, the mangosteen has been cultivated in Malaysia, Borneo, Sumatra, Mainland Southeast Asia, and the Philippines since ancient times. 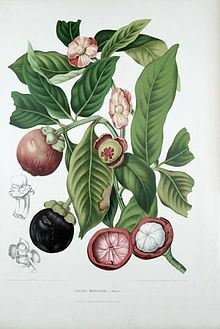 The 15th-century Chinese record Yingya Shenglan described mangosteen as mang-chi-shih (derived from Malay Language manggis), a native plant of Southeast Asia of white flesh with delectable sweet and sour taste. When the trees are approximately 25–30 cm (10–12 in), they are transplanted to the field at a spacing of 20–40 m (66–131 ft). After planting, the field is mulched in order to control weeds. Transplanting takes place in the rainy season because young trees are likely to be damaged by drought. Because young trees need shade, intercropping with banana, plantain, rambutan, durian or coconut leaves is effective. Coconut palms are mainly used in areas with a long dry season, as palms also provide shade for mature mangosteen trees. Another advantage of intercropping in mangosteen cultivation is the suppression of weeds. The growth of the trees is retarded if the temperature is below 20 °C (68 °F). The ideal temperature range for growing and producing fruits is 25–35 °C (77–95 °F) with a relative humidity over 80%. 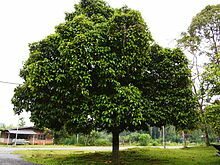 The maximal temperature is 38–40 °C (100–104 °F), with both leaves and fruit being susceptible to scorching and sunburn, while the minimum temperature is 3–5 °C (37–41 °F). Young seedlings prefer a high level of shade and mature trees are shade-tolerant. Mangosteen trees are sensitive to water availability and application of fertilizer input which is increased with the age of trees, regardless of region. Maturation of mangosteen fruits takes 5–6 months, with harvest occurring when the pericarps are purple. Mangosteen trees may reach fruit-bearing in as little as 5–6 years, but more typically require 8–10 years. The yield of the mangosteen is variable, depending on climate and age of the tree. If the young tree is bearing for the first time, 200–300 fruits may be produced, whereas at maturity, 500 fruits per season are average. At age 30 to 45 years in full maturity, each tree may yield as many as 3,000 fruits, with trees as old as 100 years still producing. The pathogens which attack mangosteen are common in other tropical trees. The diseases can be divided into foliar, fruit, stem and soil-borne diseases. Pestalotiopsis leaf blight (Pestalotiopsis flagisettula (only identified in Thailand)) is one of the diseases which infect especially young leaves. Furthermore, the pathogen causes the fruits to rot before and after the harvest. Additional stem canker and dieback are caused by the pathogen. Some of the symptoms of stem canker are branch splitting, gummosis and bark blistering. The main areas where the disease was observed are Thailand, Malaysia and North Queensland. Another common disease is the thread blight or white thread blight disease (Marasmiellus scandens) whereas the name comes from the mycelia which resembles thread. Leaves, twigs and branches may also be damaged by the disease. The spores spread with the help of wind, raindrops and insects, and thrive in shady, humid and wet conditions. Phellinus noxius living on the roots and trunk bases causes brown root disease, a name derived from the appearance of the mycelium-binding soil particles. The distribution of the fungus happens through contact with infected wood or thick rhizomorphs on tree stumps. There are a few pests which feed on mangosteen leaves and fruits including leaf eater (Stictoptera sp. ), leaf miner (Phyllocnictis citrella) and fruit borer (Curculio sp.). Especially in nurseries, the larval stage of the leaf eater can cause visible damage on young leaves, but can be managed by biological control agents. The larval stage of fruit borer (Curculio sp.) feeds on different parts of fruit before ripening. Measures to inhibit sun scalding to minimize leaf blight and stem canker. Reduction of wounds caused by insects and storm damage to minimize disease incidence. Change of the microclimate by tree spacing and pruning. Chemicals applied to root collars and tree stumps to control root diseases. Fungicides to control fungal pathogens. Biological pest control or insecticides to control insects. The edible endocarp of the mangosteen has the same shape and size as a tangerine 4–6 centimetres (1.6–2.4 in) in diameter, but is white. The number of fruit segments corresponds exactly with the number of stigma lobes on the exterior apex; accordingly, a higher number of fleshy segments also corresponds with the fewest seeds. The circle of wedge-shaped segments contains 4–8, rarely 9 segments, the larger ones harbouring the apomictic seeds that are unpalatable unless roasted. As a non-climacteric fruit, a picked mangosteen does not ripen further, so must be consumed shortly after harvest. The endocarp is the white part of the fruit containing a mild flavor that makes the fruit popular for eating. When analyzed specifically for its content of essential nutrients, however, mangosteen nutrition is modest, as all nutrients analyzed are a low percentage of the Dietary Reference Intake (see table for canned fruit in syrup, USDA Nutrient Database; note that nutrient values for fresh fruit are likely different, but have not been published by a reputable source). Before ripening, the mangosteen shell is fibrous and firm, but becomes soft and easy to pry open when the fruit ripens. To open a mangosteen, the shell can be scored with a knife, pried gently along the score with the thumbs until it cracks, and then pulled apart to reveal the fruit. Alternatively, the mangosteen can be opened without a knife by squeezing the shell from the bottom until it breaks, allowing the shell to be removed and the fruit eaten while intact with the stem. Occasionally, during peeling of ripe fruits, the purple exocarp juice may stain skin or fabric. Various parts of the plant have a history of use in traditional medicine, mostly in Southeast Asia; it may have been used to treat skin infections, wounds, dysentery, urinary tract infections, and gastrointestinal complaints, although there is no high-quality clinical evidence for any of these effects. Dried fruits are shipped to Singapore to be processed for medical uses which may include dysentery, skin disorders, and various other minor diseases in several countries across Asia. There is no reliable evidence that mangosteen juice, puree, bark or extracts is effective as a treatment for human diseases. The extract of mangosteen peels are traditionally used in Indonesia as the source of natural dye for textile colouring; to acquire brown, dark brown, purple to red hues, especially applied in traditional tenun ikat and batik textiles. Mangosteen peel contains xanthonoids, such as mangostin, and other phytochemicals.Polysaccharide and xanthone compounds are found in the fruit, leaves, and heartwood of the mangosteen. Fully ripe fruit contain xanthones, garthanin, 8-disoxygartanin, and normangostin. ^ a b c d e f g Stone D (26 May 2016). "Meet the mangosteen". The Plate. National Geographic. Retrieved 2 June 2016. ^ a b c d e f g h i j k l m n o p q r s t u v w x y z aa ab ac ad ae af ag Morton JF (1987). 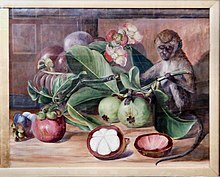 "Mangosteen". Fruits of warm climates. Purdue University. pp. 301–304. Retrieved 4 December 2012. ^ a b c d e f g h i Karp D (9 August 2006). "Forbidden? Not the Mangosteen". The New York Times. Retrieved 22 May 2010. ^ a b c d Karp D (8 August 2007). "Mangosteens Arrive, but Be Prepared to Pay". The New York Times. Retrieved 22 May 2010. ^ Mabberley, D.J. 1997. The plant book: A portable dictionary of the vascular plants. Cambridge University Press, Cambridge. ^ "Garcinia mangostana (Clusiaceae)". Montoso Gardens. Retrieved 4 December 2012. ^ Ma H, Feng C, Mills JV. Ying-yai Sheng-lan: 'The Overall Survey of the Ocean's Shores' (1433). p. 92. Retrieved 2 May 2015. ^ "Mangosteen". Encyclopædia Britannica. Retrieved 2 May 2015. ^ a b c d e f g h i j k l m n Crown I (2014). "Science: Mangosteen information". Mangosteen.com. The mangosteen website. ^ Apple RW (24 Sep 2003). "Forbidden Fruit: Something About A Mangosteen". New York Times. Retrieved 13 June 2012. ^ a b c d e f g h i j k l m n o p q r bin Osman, Mohamad (2006). Mangosteen Garcinia mangostana L. Southampton, UK: University of Southampton. ISBN 0854328173. ^ a b c d e f g Yaacob O, Tindall HD (1995). Mangosteen cultivation. Rome: Food and Agriculture Organization of the United Nations. ISBN 92-5-103459-1. ^ a b c d e f Diczbalis Y (2011). "Farm and Forestry Production and Marketing for Mangosteen (Garcinia mangostana)". Elevitch C.R. ^ Paull RE, Duarte O (2012). Mangosteen. Crop Production Science in Horticulture. ^ a b Te-chato S, Lim M (2005). "7.1 Garcinia mangostana Mangosteen". In Litz RE. Biotechnology of Fruit and Nut Crops. Wallingford, UK: CABI Publishing. ^ a b c d e f g h i j k l m Lim TK, Sangchote S (2003). "16 Diseases on Mangosteen". In Ploetz RC. Diseases of Tropical Fruit Crops. Wallingford, UK: CABI Publishing. ^ Simon PW (26 May 1996). "Plant Pigments for Color and Nutrition". US Department of Agriculture, republished from HortScience 32(1):12–13, 1997. ^ "Mangosteen, canned, syrup pack, per 100 g". NutritionData.com. Conde Nast. 2012. Retrieved 31 May 2013. ^ Karp D (27 June 2007). "Welcome at the Border: Thai Fruits, Once Banned". The New York Times. Retrieved 22 May 2010. ^ "Market Potential for Mangosteen and Salaaca" (PDF). Food and Agricultural Organization of the United Nations. Retrieved December 4, 2014. ^ "How To Open A Mangosteen". Thailand Breeze. 2014. Retrieved March 11, 2017. ^ a b c Obolskiy D, Pischel I, Siriwatanametanon N, Heinrich M (August 2009). "Garcinia mangostana L.: a phytochemical and pharmacological review". Phytotherapy Research. 23 (8): 1047–65. doi:10.1002/ptr.2730. PMID 19172667. ^ "Mangosteen uses". WebMD. 2016. Retrieved 18 September 2016. ^ Gross P, Crown I (May 21, 2009). "The Mangosteen Controversy". New Hope Network. Retrieved 4 January 2010. ^ Kusumawati, Nita; Santoso, Agus Budi; Sianita, Maria Monica; Muslim, Supari (2017). "Extraction, Characterization and Application of Natural Dyes from the Fresh Mangosteen (Garcinia mangostana L.) Peel". International Journal on Advanced Science, Engineering and Information Technology. 7 (3): 878. doi:10.18517/ijaseit.7.3.1014. Retrieved 2019-02-28. ^ "Mangosteen price too low: farmers". The Nation. 31 July 2007. Archived from the original on 21 September 2012. Retrieved 4 December 2012. ^ Temple-West P (5 March 2008). "Tropical sweetness: harnessing the elusive mangosteen". Medill Reports. Archived from the original on 10 January 2010. Retrieved 4 December 2012.